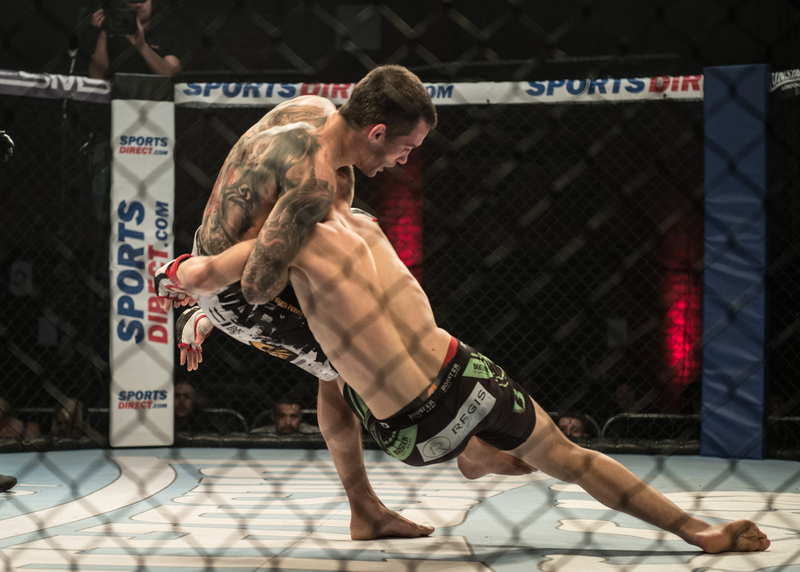 Regis ‘The First’ Sugden exploded onto the professional MMA stage on Saturday 6 December, taking victory by TKO just 38 seconds into round two of his fight in front of a sell-out crowd at BAMMA 17 in Manchester. In the run up to the night, there was plenty of speculation about how the 19 year-old from Suggy’s Gym would do in his pro MMA debut, coming as he does from a gym known worldwide for the success of its stand up fighters. Up against Eagle MMA’s Paul Bentley, Regis was quick to demonstrate that he was ready to make his name in the pro MMA arena, scoring the first take down against an older, experienced opponent. After dominating on the ground, he disengaged and stood back up to throw some great punches from all angles before the fight went to the floor towards the end of the first round, with Paul desperate to find a way of unsettling Regis. Regis was clearly on top at the end of the first round and left his opponent badly cut and bruised from some vicious knees to the head. Listening to the instructions of the Suggy’s Gym corner to believe in his stand up a little more and plant his feet paid dividends as the second round began. After a perfectly timed spinning back kick landed flush to Paul’s stomach, Regis frustrated his opponent further with some equally well timed punches and kicks. Despite looking the worse for wear, Paul continued to push and come forward. But after landing a low kick, Regis moved off to the right to follow through with a massive overhand right and a lightning double left hook which lifted Paul off the floor and left him in a heap on the canvas. Jumping on his opponent, Regis proceeded to strike and, after a few seconds of ferocious punches landed ground and pound style, referee Marc Goddard stepped in to stop the contest. “Looking up to see a world-famous BAMMA and UFC referee pulling me off my opponent was a really surreal moment,” said Regis. 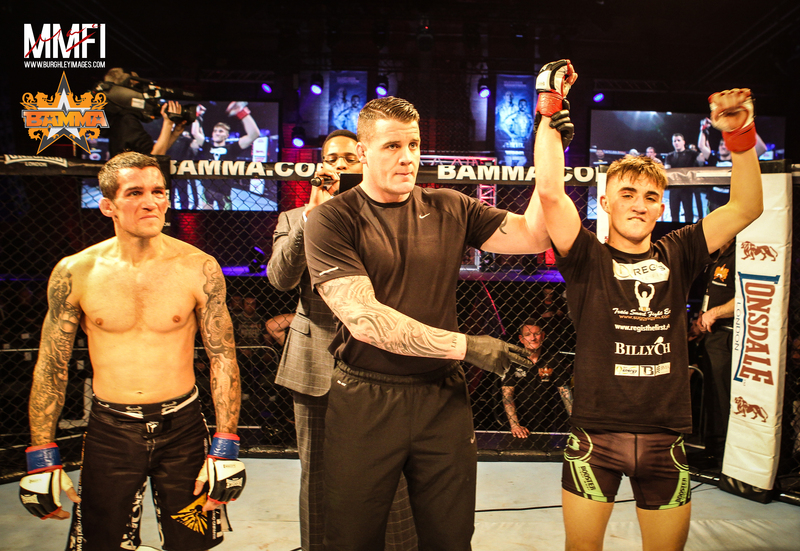 “I think that was the point when I actually realised I’m now finally fighting on the stage I set out to make my own six years ago, when I was first introduced to MMA by Terry Donovan. “Along the way, I’ve been lucky enough to be trained by the best in the business, including Jimmy Wallhead, Ranjeet Baria and Jude Samuel. I just want to thank them all for their support and their belief in me and in my future in professional MMA. Head coach of Suggy’s Gym Dean Sugden commented: “Regis showed great head movement and footwork and listened to his corner Jimmy Wallhead, who was impressed with his ability to spoil and control even from his back. “After the fight, BAMMA’s expert summariser Frank Trigg described Regis’s double left hook as the best he’d ever seen. Given that he was the only fighter in the prelims to be interviewed by Frank, I think we can safely say that Regis definitely made his mark on Saturday.